At Last Key Realty, our Guest Services Coordinators are the face of our brand. They are a personal contact for our guests throughout the entire vacation process. From the moment you arrive in Key West until the time you leave, our Guest Services Coordinators are responsible for making sure your vacation is as rich and enjoyable as possible. After your reservation has been finalized, your Guest Services Coordinator makes first contact with the you via a “Welcome Letter”. This initial letter provides our guests with an agenda of what to expect from that moment leading up to the time of your arrival. The next step is fulfilling any guest requests or special accommodations in preparation for guest arrival. This could include any number of preparations depending on your particular request. Whether it be converting beds to a certain configuration, shopping for the groceries you requested to be ready upon your arrival, or simply answering questions about Key West that may come up as you make your plans and start to pack. Here is basically where all of the behind the scenes action occurs. Now comes the fun part… guest arrival! Your arrival is really an “event” for us. We are planning not only to welcome you to a meticulously prepared vacation home, but also to kick off your vacation itself in the best way we can. We cut out the “go to an office to pick up a key” step in your valuable arrival timeline and ask you to head straight to your vacation home, where your Guest Services Coordinator will meet you for check-in. Each Guest Services Coordinator has their own unique check-in process, but an arrival typically includes a thorough presentation of the property, any possible recommendations of restaurants or activities in the area, and anything else involved with making sure you are properly settled in. Although the Guest Services Coordinator physically leaves the property after check-in, they are essentially with you throughout your entire stay. Our plan is for your stay to go completely uninterrupted, but of course things happen (even in paradise!). Should any problems/inconveniences occur during your stay, the Guest Services Coordinator is only a call away, and will handle the situation in a timely manner, guaranteed! When it comes time for departure your Guest Services Coordinator will come to the property and bid you farewell, providing a bittersweet ending to what is hopefully the most enjoyable vacation of your life! 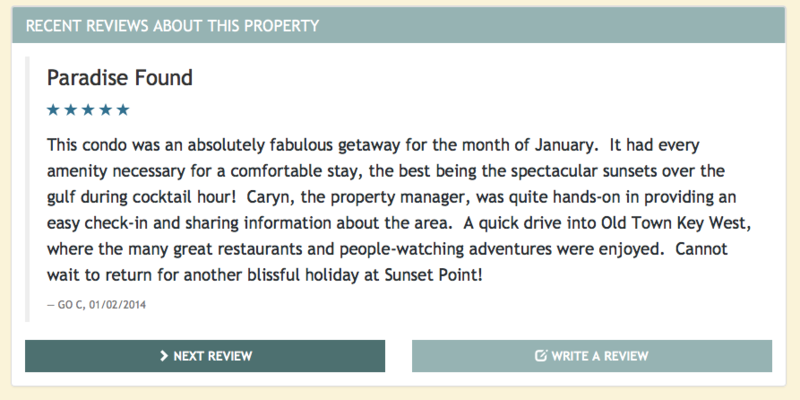 The best way to really see how a Guest Services Coordinator can impact your stay is to read the reviews for any of our vacation homes. 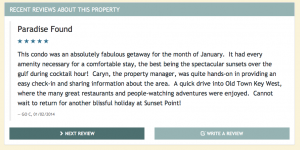 Yes, you’ll find mention of a beautiful, clean, well-maintained and fully equipped property, but you will also find mentions of the particular Guest Services Coordinator involved in that stay and how he/she helped make the trip memorable and enjoyable. To meet our Guest Services Coordinator team, visit our Meet Our Staff page. Ready to experience the Last Key Realty difference for yourself? Browse and reserve our vacation homes right here on our website to start planning your Key West adventure. We look forward to displaying our unrivaled guest services to you on your next visit to Key West!